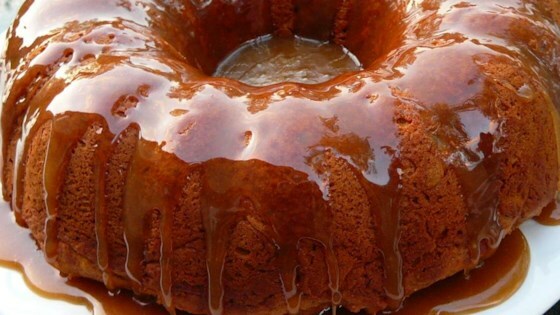 "This is an excellent caramel glaze frosting sprinkled with toasted pecans. Makes enough frosting for a 9x13 cake." In a shallow 6-inch saucepan, thoroughly mix brown sugar and flour. Stir in butter and milk, and cook over medium-high heat until mixture comes to a rolling boil. Boil exactly 1-1/2 minutes. Remove from heat. Allow to cool 5 minutes. Beat with a wooden spoon until mixture begins to thicken. Mix in vanilla and continue beating until frosting is the consistency of thick honey, no more than 1 to 2 minutes. Immediately pour caramel frosting onto cooled cake and quickly spread with the back of a warm spoon before frosting begins to set up. Quickly sprinkle top of cake with toasted pecans. Frosting will set up completely in a few hours. This was delicious - just what I was looking for to top off a not-too0sweet spice cake. Thanks so much! VERY good! Great on Southern Praline Pecan Cake. Will try this on Sticky Toffee Pudding. Great with or without the added pecans & quickly hardened to a nice smoothe finish. Perfect glaze to use atop Fresh Apple Cake II. Using the whip attachment on my mixer instead of hand-mixing made this recipe even easier. Thanks! Used this on butter bundt cake. Delicious! YUMMY! I used Splenda Brown Sugar Blend and almond milk. I used it for pumpkin bread....so good! Thank you for the wonderful recipe!